The best gift we can get these holidays is to see that our support has helped your research, leading to improved scientific publications, PhD thesis, and increased research projects successfully accomplished… Happy Holidays!! AFFINImeter is currently the best software for the analysis of Isothermal Titration Calorimetry data to obtain a complete thermodynamic and kinetic characterization of molecular interactions. If you are already an user you are probably aware of all this information, anyway, we thought that you would like to have a compilation of all the resources we have developed for divulgation and didactic purposes during this year 2015! For the upcoming year we promise you plenty of new features and improvements in AFFINImeter! 5 Ways in which AFFINImeter can improve your research! Get more citations from your publications. As you must know with AFFINImeter complex reaction schemes can be written to describe a real scenario in chemical language. AFFINImeter provides an exclusive “Model Builder” to write the chemical equations describing your system. We have shown you how to take advantage of the model builder. Representative binding models based on a Stoichiometric equilibria and Independent sites approach. Guide and tutorial of How to perform a Global analysis with AFFINImeter? Complex binding models are usually described by many variable parameters and, in such cases, a single experimental curve is insufficient to achieve a robust analysis. During this year we have prepared several cases of use to show you how to solve easily complex fitting analysis, for instance a global fitting of several ITC isotherms. KinITC: Get all the kinetic information from your ITC raw data! We have implemented KinITC, this is a methodology recently developed by Philippe Dumas (CNRS, France) to simultaneously get kinetic and thermodynamic information from a standard ITC experiment. With one single titration experiment it calculates the kinetic constants (kon and koff) and the thermodynamic data (KD and ΔH) of 1:1 binding interactions. The current implementation of kinITC in AFFINImeter is valid only for 1:1 interactions but we intend to extend this for more complex systems in the near future. Did you miss our Webinars? Here you can get the slides of the presentations! AFFINImeter was guest presenter of the Malvern webinar on advanced Isothermal Titration Calorimetry (ITC) data analysis. (Read more). The following slides corresponds to different webinars that we have done for research groups interested in learning more about AFFINImeter. Chapter Seven-Extending ITC to Kinetics with kinITC (Philippe Dumas, et al, 2016). Implementation of kinITC into AFFINImeter (Philippe Dumas, et al, 2015). Isothermal Titration Calorimetry: Assisted Cystallization of RNA-Ligand Complexes (C. Da. Veiga, et al, 2015). Extending ITC toKinetics with kinITC (Philippe Dumas, et al, 2015). 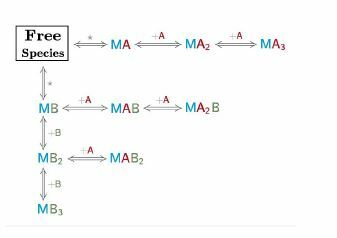 Metal binding spectrum and model structure of the Bacillus anthracis virulence determinant MntA (E Vigonsky, et al, 2015).